Would you think that this healthy vegetable could be converted into something unhealthy? When glancing at a list of ingredients, many of the words are not simply unfamiliar but completely unknown to the average consumer. This being the case, checking a list of ingredients seems an almost futile exercise as many of the foods listed are unheard of. When it comes to the various forms of sugar in food, the inability to recognise ingredients can be a huge concern for the health-conscious consumer. The amount of sugar in store-bought products is worrying enough. However, another issue is that consumers very often don’t realise that products frequently contain more than one type of sugar. One of the many varieties of sugar is known as high fructose corn syrup (HFCS). Do not be deceived by the name; being derived from corn starch does not make this a healthier alternative to sugar. The entire production process for HFCS is completely unnatural, requiring several complicated steps. The process begins with breaking down the corn starch by adding various enzymes. The corn starch is then further modified in order to raise its percentage of fructose, since it is this fructose which contributes to the high levels of sweetness. Despite the expense of this conversion, it is more economical than the price of ordinary table sugar. This is one of the reasons why HFCS features in so many drinks, cereals and snacks. Another reason is that HFCS is more soluble than ordinary sugar, making it an attractive choice for companies producing various drinks. In comparing HFCS to other forms of sugar, when it is ingested, it travels directly to the liver where it becomes fat. As an additional problem, it does not, unlike other carbohydrates, cause the pancreas to create insulin. The outcome of this is that any food with HFCS immediately gets converted into fat, and to add insult to injury, you are left with the feeling of being unsatisfied. Research in this area has shown that HFCS leads to faster weight gain than ordinary sugar. It also increases the risk of type 2 diabetes and can cause liver damage. All this really means is that when glancing down a list of ingredients, try to avoid products where HFCS features high on the list. It is possible to replace cereals loaded with HFCS with a healthy mix of rolled oats and fresh cut fruit to give yourself a sweet treat. Fruits like watermelon, for example, are extremely versatile, and will give you more than just a burst of sweetness, being full of vitamins. It is difficult to avoid sugar completely, but when possible try to avoid HFCS since the processing it goes through makes it an altogether unhealthy option. It’s unfortunate that so much inaccurate information has been perpetuated regarding HFCS. HFCS is in fact a sugar made from corn and is nutritionally equivalent to other caloric sweeteners. Anecdotal stories and poor reporting of scientific results have created many myths surrounding what HFCS does or does not do. The two types of HFCS contain either 42% fructose or 55% fructose – percentages well in-line with the 50% seen in sucrose (table sugar). It is metabolized via the same metabolic pathways as other caloric sweeteners. To say that “it goes directly to liver and becomes fat” is not only inaccurate but a gross oversimplification of metabolism. HFCS is NOT a unique contributor to obesity or any other chronic disease for that matter – respected health experts as well as the Am Medical Assoc and Am Dietetic Assoc agree on this point. Rather, it is excessive calorie intake from ANY SOURCE that causes obesity, and it is our complete diet and/or lifestyle choices that influence the likelihood of developing diseases such as cancer. Marketing techniques have further fueled the HFCS-free bandwagon – and it is just that, a trendy bandwagon designed to sell products. Until we realize that any source of sugar can be enjoyed in moderation, Americans will inevitably continue the trend towards bigger and bigger waistlines. Doc, you’re right about the difference in corn, but at least this picture is in the right family of vegetable. I’ll try for a better choice next time. 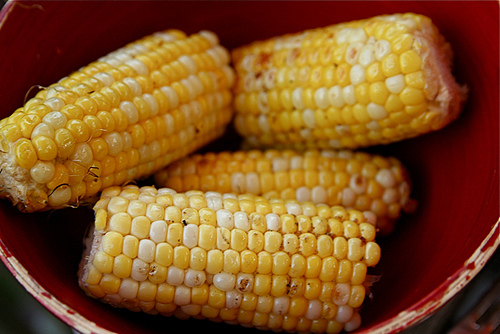 Why do editors always include pictures of sweet corn with any article about corn (maize)? Hey! It’s not that kind of corn! Sweeteners, ethanol, animal feed etc. are made from “dent corn” or other types of field corn, not from the vegetable sweet corn. See clarification at http://docsgreen.blogspot.com/2007/05/amaizeing-confusion.html and make the picture match the text.